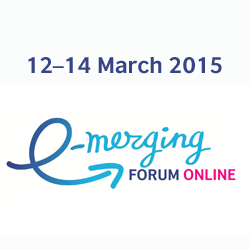 Being a registered blogger of E-merging forum 5 is not such an easy job. Even though I went to bed quite late I had to wake up early to write my impressions of Day 2. It was packed with emotions and information, charismatic speakers and fun at the evening event. Even though it was Friday 13th, the atmosphere at the forum was quite cheerful and energetic. My day started with the plenary of Svetlana Ter-Minasova “Teaching language issues in today’s Russia: to think about”. Each and every plenary and parallel session is different and this one was unique. First of all, because it was delivered without any slides and I found it quite refreshing. It was possible to focus on the speaker catching every word and phrase being said. I was listening to the session in Hall Fantasia where it was broadcasted online. It is only natural that there were no seats available in the main hall of the event. I never regretted my decision to watch this talk online because I could see the speaker very well and the quality of online coverage was perfect. Our brain has a tendency to remember what seems bright in every talk. Looking back at the plenary session by Svetlana Ter-Minasova I remember that I was having a lot of fun. It was a pleasure to be listening to the speaker which such extraordinary storytelling skills. I am not sure I remember all the ideas given in the talk but some of the statements can rightly become aphorisms. Let’s look at some of them. Now this is when I wish there were slides, they are quite helpful when one needs to remember what the talk was about. She started off by sharing her personal story of the influence of British Council on her life. And then a wonderful quote which I have been using in my classes so much because I had already been to the talks by Svetlana Ter-Minasova and her ideas are always very useful. “Don’t be afraid to show that you are a foreigner. There is nothing more suspicious than a foreigner speaking your mother tongue the way you do”. We learned from the talk that “cultural mistakes are never forgiven” unlike language ones which just makes us look humane to the native speakers of English. “It is impossible to master a foreign language to the level of a native speaker” and maybe it is also unnecessary. Cultural identity should still be present. Personally, I refuse to stop learning because I am greatly enchanted by the process of getting to know new things in English. It is enough to just love one thing – either the students or the subject, if a teacher loves both it doubles the effect. Maybe that is what an ideal teacher should be like? Even though Svetlana Ter-Minasova is against perfectionism and she gave good examples of how it can hinder the ability to communicate in a foreign language. “It is an admirable idea to teach people about their own country”. Being absorbed in getting to know foreign languages and foreign cultures we tend to forget how precious the history and culture of our own country is. It should not be forgotten! So the conclusion is that I am definitely going to listen to the recording of this session again because it was so enjoyable. A real treat for the participants of E-merging forum 5! E-merging forum 5. Anna Loseva "Flashmobelt"